The Remo Outdoor Armchair Single Seat Lounge Chair is a contemporary outdoor chair perfect for Hong Kong outdoor spaces. Outdoor furniture is an excellent way to utilize outdoor space. Whether you are hosting guests on your rooftop for an outdoor party or looking to create a tranquil outdoor environment in the sky alongside the Hong Kong hustle & bustle, outdoor furniture is great for any outdoor occasion. This modern design outdoor armchair and single seater is perfect for contemporary rooftops, terraces and balconies. 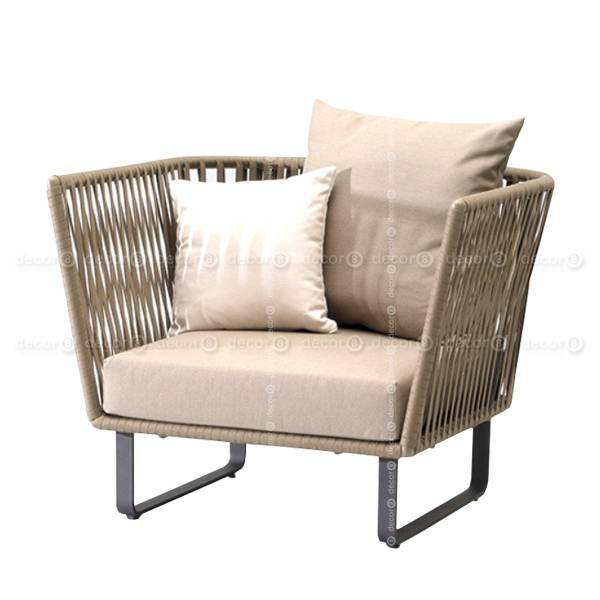 This stylish outdoor armchair and single seater lounge chair is made of woven PE Rattan. Synthetic rattan is durable and is UV resistant and water resistant - a great material for outdoor furniture in Hong Kong. Looks great with the other outdoor seating in the Remo Outdoor Furniture Collection. Easy to maintain, lounge in comfort and in style. Comes with seat pad and back cushions in water resistant fabric. Light Brown PE rattan. Beige Cushions. For other colors please contact Decor8.